As the elegant man’s closest ally, the De Fursac’s suits sharpen your silhouette with style and precision, meeting at the crossroads of yesterday’s sophistication and today’s contemporary chic. 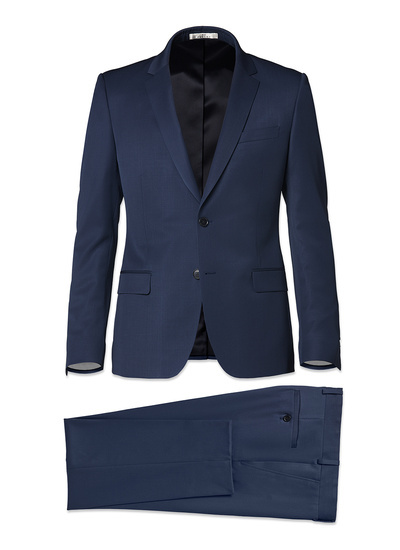 There are two cuts of men’s suit available: the regular fit, whose sizes (from 48 to 60) is ideal for the most athletic morphologies, and the more fitted slim fit suit. Select a navy blue with a discreet pattern (bird’s eye, nail head, muted Prince of Wales check, end-on-end, pinstripes) or an anthracite grey suit to look good at the office, and don’t hesitate to wear it with a checked or sky blue stripe shirt. A tie in madder silk, jacquard or knit, is also most welcome. To make an impression at a party or a ceremony choose a men’s tuxedo (with a shawl, tailored or peak collar) or a three-piece suit, and complete the look with the ideal shirt, either with a hidden placket or a wing collar. Both are perfect if you’re looking for a men’s wedding suit, but once again an accessory will make all the difference whether it’s a bow tie, a silk pocket square or an ascot scarf. Finally to kick back while remaining chic, we suggest the sporting of a Prince of Charles check or a light houndstooth – in flannel or cotton. Avoid a black suit, choose light colours, and don’t forget to couple your men’s suit with a casual shirt, a polo shirt, a round neck sweater or a judicious piece of knitwear if the weather isn’t looking so fine. Fashioned from unique fabrics, the brand’s men’s suits enjoy wonderfully established relationships with the very best Italian clothiers. For example the legendary Lanificio F.Ili Cerruti has developed a number of exclusive and exceptional fabrics such as the Super 130’s, Super 150’s AAAAA and the Turbo 180 wools, especially for De Fursac. To really highlight these materials as much as your own physique, be sure to choose the right sized jacket and trousers. Make sure the jacket hangs without being confining, that it follows your shoulders without contradicting them, and that it slightly nips in your waist without strangling it. The back vents should be closed when you are standing up. In short it’s all about achieving elegance while avoiding discomfort. As for the trousers of a De Fursac men’s suit, they can be lengthened or shortened according to the length of your legs and your own personal taste. Some men like a shorter leg that reveals the ankle, while others prefer to see the hem of their suit trousers breaking on their shoes. Please note that for all men’s suits purchased in the De Fursac e-boutique, the delivery and return costs in mainland France are automatically free of charge, as are the collection of a package in-store and any alterations done in a boutique, outside promotional periods.